Congratulations to Stephanie du Toit who was Best Girl in the Major U10 section of the London Junior Chess Championships with 4.5/7. 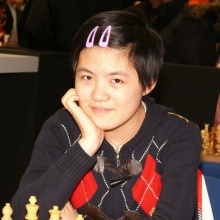 She got 2.5/4 on Saturday and 2/3 on Sunday in a strong Swiss tournament. She only dropped points to 3 boys who finished in equal 3rd position. Full results are available from http://www.ljcc.co.uk/results.htm. This is an annual well organised and run strong player tournament.